Natural Face Peeling oil with lavender grains Bioaroma was added to your shopping cart. Unique natural face scrub (Peeling) oil with lavender grains and grapeseed oil. Ideal to remove dead skin cells and provide anti-wrinkle and firming properties. Natural Face Scrub (Peeling) by Bioaroma with lavender grains and grapeseed oil to remove dead skin cells and provide anti-wrinkle and firming properties to offer your skin a velvet texture. For a youthful and velvet face skin, apply face scrub with your fingers, massaging gently, insisting on black spots. Avoid contact with eyes since essential oils could cause eye irritation. Wipe off gently with a cotton to remove the lavender grains. The grape seed oil need no rinsing and by massaging it will be completely absorbed by your skin. Ιngredients: Grapeseed Oil, Ylang ylang Oil, Lavender oil and components of 100% natural essential oils such as Geraniol, Farnesol, Linalool, Benzyl benzoate. 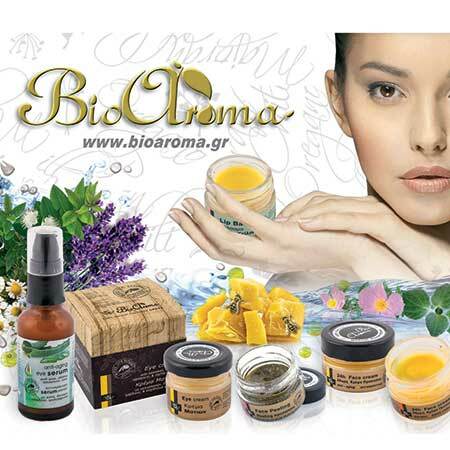 100% natural product made in the island of Crete in Greece.